This week's review is of the Mizon Snail BB cream, specifically their Multi Function Formula Snail Repair Blemish Balm with SPF32/PA++. It's part of a line of snail-based beauty products from Mizon, which was a brand I had never heard of until I learned of their snail BB cream from beauty blogger PBunnieP and after her rave review, I had to try it myself. 2015 update: Wow, looking back at old photos from old cameras is painful. Everyone has to start somewhere, right? Hold the phone, you did not just say SNAIL?! Yep, I did. More on that later. That is the most disgusting thing I have ever heard of putting on my face! I'm outta here. You'd be missing out on something that has a near-miraculous effect on acne. Snail filtrate (meaning it's harvested [cruelty-free] from a species of snail farmed just for this purpose, and then filtered) is famous for it's skincare benefits, which include speeding the healing process of any wound, which means it helps heal your acne more quickly and without scarring. Seriously, just google it. To me, that's huge. As long as the little guys are not harmed, I'm all for anything that will help me combat the acne that continues to plague me right into my 30's. It is also linked to various skin benefits and supposedly it has been clinically tested to confirm that it does in fact have chemicals in it that assist with regenerating the skin, as snails rely on healing abrasions, preventing infection, and quickly reducing inflammation so they are not compromised by whatever sharp nasty things they are gliding over. Makes sense when you think about it that way, doesn't it? It would be like dragging the inside of your lips over any and all surfaces; you wouldn't survive if you didn't have a way to keep the ensuing abrasions and contamination from killing you. It's not even that exotic an idea anymore; it's been A Thing in the beauty world for quite a while, including Brazil, France, and of course Asia. Texture: Surprisingly liquid, more like a foundation than the thicker, creamy consistency I am used to in a BB cream, such as Skin79 or Missha. Sheer to medium coverage, but builds easily due to how thin it is. Colour: NC15 almost exactly, see below comparison to a NC15 Studio Fix concealer and Missha's #13 Perfect Cover BB cream, or see how it compares to my swatch mega post against Lioele, Missha, and Skin79 BB creams. Finish: Very natural, has one of the most natural finishes of any BB cream I have tried. Neither too matte nor too glowy. Scent: Unlike the Skin79 Snail BB cream sample I tried, which smelled like a creepy old lady (mothballs, rancid outdated perfume, undusted furniture, and the faded dreams of a lifetime) this cream smells sort of like a lighter version of my Elisha Coy BB All-In-One Cleanser, which reminds me of herbs and wildflowers. Looking at the ingredients, I see a lot of flower extracts (see ingredients image below), and I swear it doesn't smell like dying senior citizen or anything I could imagine snails to smell like. Packaging: Squeeze tube, with an oval shape that makes getting the cap securely back on easy. I would have preferred a pump because it's tricky to control such a liquid product with a squeeze tube. Availability: I got mine from a seller on ebay and had no problems, other than the fact that it took a very long time to get here. I would have preferred a US seller for accountability and faster shipping, but none of the US sellers I use carried this particular BB cream. **Update: Prettyandcute.com is now carrying this BB cream, and it's only $20! Price: I got it from the above seller for approximately $20 USD including shipping. Repurchase: Yes, because of all the BB creams I have, I feel that this one has the best skin care result. I do love this BB cream. Like anyone who wanders onto the slippery slope of BB creams, I have developed a collection that far outweighs any chance of actually using them up before the expire. Like a shoe addict, I hover over them in the morning, deciding which one I want to wear that day. Am I in a full-coverage mood, do I want the best skin tone match, do I feel like my skin wants to be babied? However, Mizon's snail BB cream is what I use daily unless my skin is in revolt and I need heavy coverage (Skin79 Orange Vita) or I am going out (Missha Perfect Cover in #13) and want to dress up. It is the most soothing, gentlest, non-reactive BB cream I have, and it is super light on the skin. Even in the throes of my skin's holiday vendetta against me, I noticed my skin looked better when it came time to take it off after a day's wear. There are pictures below, and they ain't pretty. Don't say I didn't warn you. Holiday skin disaster aside, it's hard for me to say that all the miraculous acne improvement and the speed at which my blemishes healed were entirely due to the BB cream, as I also picked up Mizon's Snail Recovery Gel after I had obsessively researched snail filtrate and read countless reviewers breathlessly testifying to it's abilities. Sadly, I am out of the Recovery Gel now (cue wailing and gnashing of teeth as I f5 the tracking data page for my replacement tube) but will have a review up for it soon reviewed here. Between the 74% Gel and the 45% BB cream, my skin was smoother, clearer, and best of all, the blemishes I did get (as my skin tapered off it's Great Clarisonic Purge of 2012) cleared up quickly and left fewer scars. I'm completely a snail filtrate convert now, and am anxiously waiting for the essence (serum) and face cream from Elisha Coy's snail line to arrive, along with my replacement Mizon Recovery Gel. Snail goodness aside, how did this measure up as BB cream? Honestly, if it didn't have magical snail slime from sparkly unicorn rainbow snails in it, it would be a fairly middle of the road BB cream, because it just doesn't last on the skin. Double for oily areas, such as the T-zone. I would give it 3-4 hours, tops, before it begins to fade on the dry areas of my face and break in the oily areas. I don't wear primer or powder with my BB creams, because I wear them primarily for skin care and sun protection and I feel primers defeat the purpose if they are a barrier between the BB cream's skincare and your skin, y'know? You are about to view close-ups of the post-holiday wreckage of my skin, not suitable for children, the elderly, or the faint of heart! Scroll at your peril! **Update: I have replaced the original image with a megaswatch photo to compare Mizon with a larger range of BB creams. As you can see even in these pictures, NC15 is still a little dark on me, but since my face has been darkened from sun damage, it blends nicely with no issues. Below are the action shots during the Holiday Horrorshow. Note: my skin is very red from irritation and liberally speckled with angry breakouts in these pictures, and although the Mizon BB cream may seem too yellow on my cheeks, compare it to the skin on my neck and how much closer (and less red) my cheeks are after application. It really evens things out nicely in a single layer without losing the natural skin look. I apply all my BB creams with a beauty blender dupe sponge as I find application with my fingers highlights otherwise unnoticeable skin flakes, even when gingerly patted on. If you have never heard of these sponges, you are missing out! 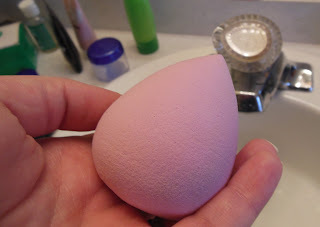 They're a sponge you use damp instead of dry, and the lack of sharp edges gives you a perfect blend, unlike the traditional triangle shaped cosmetic sponges. The point on the tip is great to get into the crease of your nose or under your eyes. I recommend youtube for usage and care of the sponge. You only need a tiny amount of this product, but due to the squeeze tube, it's easy to end up with too much. I always apply it to the back of my hand, dab on what I need (see above) and then blend with the sponge. And lastly, we have the ingredients list (click here for viewable text size) which details some of the plant extracts that influence the scent. And with that, I'm done. I sincerely hope that if you are in the NC15-20 colour range and interested in expanding your BB cream collection to include snail care items, you will give this one a try. If you are not familiar with BB creams, I can't say how this will measure up to your expectations, because BB creams are just not the same animal as foundations. You may find the liquid texture to be easier to work with, but you may also be put off by the sheerer coverage and the short wear time. If you're in the market for a tinted moisturizer and the snail angle intrigues you, definitely check it out. Leave me a comment below if you found this helpful, or if you have any questions! I anxiously await your reviews of the other snail skincare products! I'm loving my current BB cream's coverage so I don't think I'll switch, but I want in on the snail thing! Very interesting- I might have to check this out. :0 I'm an NW15-20, but I've found that Lioele Triple the Solution is really great for me, and I'd even go so far as to say that it 'brightens' my skin tone while I'm wearing it. Glad you have something that works for you! Unfortunately the Lioele Triple was just too dark for me. I did a megaswatch post that has the Lioele Triple on it: http://snowwhiteandthepear.blogspot.com/2013/02/pale-girl-friendly-bb-cream-swatches-on.html I have heard so many good things about the Lieole Triple so I am sad that the shade isn't a match. I'm planning to buy this one soon, and PBunnieP is to be blamed in my case as well :) Thanks for the review! Hi! If I'm using Skin79 Hot Pink BB cream, do you think Mizon Snail BB cream will be too light for me? I think it will be too light, have you taken a look at my swatch post? As you can see, the Skin79 Pink is one of the "darker" BB creams I have, so if it matches you perfectly, the Mizon Snail BB is going to be too light for you, I think. If you are interested in trying it out for the snaily goodness benefits, you could always mix it with a drop of a darker foundation to adjust the colour. Thanks so much for this site and all of the reviews. I'm fair skinned as well, though I am pretty sure that I have rosacea instead of just regular breakouts (yay). Having not worn makeup regularly for approximately a decade, I'm out of my depth with all of the choices available now. Your blog has been invaluable in helping me narrow down the bb cream choices so that I don't have to buy everything under the sun and suffer through the consequences :). Thank you! :3 I totally relate to your feeling like you were "out of the game" and overwhelmed with options-- that's exactly how I felt, while simultaneously feeling like there were very few options that were suited to me and finding them was the needle in a haystack proposition. "I swear it doesn't smell like dying senior citizen or anything I could imagine snails to smell like." by the way nice review ma'am, I'm gonna try it out soon. Thanks for the great review! Is this BB cream yellow toned? I often find Korean BB creams to be too gray or pink for me. Like anyone who wanders onto the slippery slope of BB creams, I have developed a collection that far outweighs any chance of actually using them up before the expire. Like a shoe addict, I hover over them in the morning, deciding which one I want to wear that day. Am I in a full-coverage mood, do I want the best skin tone match, do I feel like my skin wants to be babied? WHO LET YOU INTO MY HEAD? ;) Kidding! I too have a "wardrobe" of BB creams that I vary depending on the weather, the look I'm going for, how my skin feels, whether I'll wear foundation on top, Currently rotating among Missha Perfect Cover, The Face Shop Waterproof, Etude House AC Clinic, and Clinique Age Control, and I'm awaiting the Mizon snail one you just reviewed to get here from Ebay. Kind of psyched, kind of grossed out at the snail thing. Not sure which is prevailing. unfortunately I didn't have much luck with the colour match - it's too dark for me :( I like the texture and I'll use it up, but I have to use a light powder over the top or it looks weird - problem is I don't usually powder, my skin is very dry as it is! Luckily the BB cream is moisturizing enough to offset the dryness from the powder (it's a pretty nice powder too, not the cakey dry kind) so it's not much of an issue, just more products on my face than I'd like. I guess I'll try that freakishly pale Missha BB cream next! Aw, BB creams can be such a crapshoot when it comes to colour matching. Have you looked at TesterKorea? They're a vendor that carries both full sizes of things but also reams of samples of every kind of korean beauty product. They are also completely transparent about their shipping charges; if you item is 201g, you pay for 205g shipping. You don't jump from 200g to 500g shipping as soon as you put something tiny in your cart. They also have a 'want' forum where you can request products and samples to be added to their inventory, which is fantastic. I recently got a deluxe sample of Skin79 Green, which I think is even lighter than the Orange. I haven't tested it fully yet because I am currently working some serious things into my routine and I have to isolate them, but that might be an option. I so appreciate your candor (sharing your skin issues) YOU GO GIRL! ive been on the fence with the snail extract for a while now because i wasnt sure if it was just another marketing ploy. Honestly, your testimony has tipped the scale for me. THANK YOU, FOR BEING YOU. I am a woman getting along in age (42) and in all sincerity the coverage doesnt really have any merit for me, i am really interested in the healing benefits more than anything and i feel like this will be a continual day moisturizer with "benefits" LOL. Then, with my night cleaning & moisturizing regimen i cant go wrong! Have you tried the newer version of this BB cream? I just got it and was looking for more reviews. I noted your comment about how "liquid" it is and that isn't how mine is. When comparing ingredients list, mine shows Titanium Dioxide as the 2nd ingredient, and it's the 4th one in yours, so I think perhaps they have reformulated it. It's wicked thick... like a heavy concealer. I applied a thin coat and then went back with a sponge to use it as a concealer and that seemed OK. However, as you noted, it does break up over oily areas. Oh well.